Biography: Angie Taffs is a small business expert who works with women looking to start their own successful business. 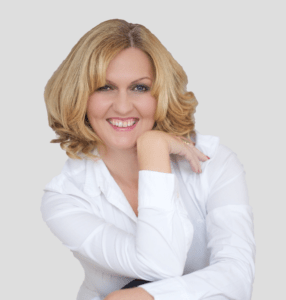 She is the founder of The Small Business Kit which provides a variety of online and one to one support packages to suit every level and every budget, so you will always have the help and support you need. Angie has over 25+ years of experience in sales, marketing, customer service, and communication and has worked with literally hundreds of women over the years in dozens of industries — from creatives, lifestyle industries, and health and wellness through to high tech and manufacturers. She is a fully qualified business advisor and has worked on many projects to support women in business including the European Women’s Enterprise Program. When she’s not working you are likely to find her indulging in her passions of shoes, shopping, and champagne or planning her next trip somewhere abroad. On quieter days, she will be either out walking along the river or snuggled up on the sofa with her beloved furry friend, Molly the Labrador.